After reading several posts about Central Gyros in this thread, I decided to do an exploratory mission for carry out food last night. As described, Central Gyros is a place frozen on 1980s amber. I was a bit surprised by the depth of the menu. Somehow I thought it would be a gyro/hot dog carry out joint, but it's a full blown restaurant with an extensive menu of Greek specialties. Besides the kitchen, where most of the food is prepared, there is a grill/gyro station right up front as you walk in with 3 spits, two of which were in full operation while I was there. I ordered avgolemino soup, which was a surprisingly excellent version, a Greek salad, which was pre-made and very much on the wilted side (although ordering one for eating at the restaurant might yield a better result), a gyro sandwich which lived up to its hype and a chicken souvlaki for The Chow Poodle which she pronounced her new favorite version. I also ordered a couple of desserts; baklava and, of course, diplas. I've got to say that while the baklava was serviceable, the diplas were very disappointing. Rather than sitting in a tray of the usual honey syrup, they were pre-packaged in plastic bags. In addition to not having much syrup, their storage in plastic rendered them soggy and not at all crisp, which is a hallmark of a good dipla. Let me be clear that this is not due to the fact that I took my food to go. The diplas are displayed pre-bagged and are always that way. I asked if the diplas were made in house and was told that they are not and were delivered a few days a week. Note to diplas lovers: If you think CG diplas are good, you should seek out the ones served at the various Greek festivals during the summer or at Athenian Bakery for an eye opening experience. Service was friendly and enthusiastic. I'll be back for an eat-in experience at Central Gyros along the The Chow Poodle and will report back on the quality of some of their other food which, I suspect judging by the plates I saw being delivered to the tables, looks to be pretty good. This was a regular haunt when I was a kid. It seems like we went every other week. My folks (and myself, aged: small) were always fans of the souvlaki sandwich and taramosalata. I probably haven't been there since I was about 12. Recently, I've been torn between wishing to return for nostalgia's sake, and fearing that my illusions would be shattered. It's VERY good to hear that you had some tasty items. Is the styrofoam art on the walls still painted gold? Are there still a minimum of three police officers in there at any given moment? Dmnkly wrote: Is the styrofoam art on the walls still painted gold? No cops when I was there and, since I was only there for carry out, I didn't inspect the wall murals very closely. I imagine it wont take more than a week for me to be back for a full scale dinner. I'll report back after that. Until I got married, that was where I had my birthday dinner every year! Besides the gyros, the combo plate is very good. It comes with souvlaki and some type of Greek sausage. The dhoulmades and pasticio are also very good. My favorite dessert is the galagalpouliko (sorry about my horrible spelling of Greek dishes!). Just talking about it is making me want to go there!! Thanks bringing Central Gyros to the forefront, hadn't been for a good 10-years and gyro wise it's even better than I remember. Avgolemino soup, as you say, was good, I liked the Greek green beans with light tomato sauce though my small taste of Pastitsio, while a solid representation, reminded me I'm not fond of the dish. Interesting wall art, basic, yet comfortable, dining room, friendly efficient service and reasonable prices make Central Gyro a good choice for lunch or mid week low impact meal out. Though be careful I noticed a few shady characters having lunch. I had to laugh when Stevez said set the way back machine to 1980. I remember seeing Sleeping Beauty at the Will Rogers when I was about 7 in 1974 - and it Central Gyros was the same then. I'm just happy that they have the same fries. I just love those plank-style steak fries and they're hard to find. These were quite excellent gyros: very thinly cut, light almost, spiced with restraint, and just slightly crisped. Usually a gyros sandwich makes me feel a little guilty if not queasy; these gyros made me feel really good about eating them. 1980 sounds about right. We used to be monthly customers, as it was sort of on the way to see one great aunt in Galewood, or another aunt who used to live in the Greek enclave at Diversey and Austin near Holy Trinity. I haven't been there for about six years. The last time I was there, the meal was virtually inedible (but we weren't having gyros), and that kind of turned me off. From where I live now, it's not the easiest place in the world to reach, so I might have to make a special trip. But I must admit, if I'm driving that far, I'd rather go to Lawrence and Kedzie and get the Lebanese versions instead. I was in Central Gyros today for an excellent gyros sandwich (not at all to my surprise), much as David H. described: lightly seasoned, lightly crisped and not at all greasy. Not being a fan of CG's style of fries, I opted for a french fry substitute: fried eggplant. I expected to get a couple tasty but greasy slabs or circles of soft eggplant. I was floored by the dish I ate: small, very thin, and very crisp half moons of eggplant. They were delightful and the perfect substitute for fries, especially when you order them with the (optional) side of skorthalia. If you've been meaning to give CG's gyros a try, make sure to add the fried eggplant to your list. eatchicago wrote: Not being a fan of CG's style of fries, I opted for a french fry substitute: fried eggplant. I expected to get a couple tasty but greasy slabs or circles of soft eggplant. I was floored by the dish I ate: small, very thin, and very crisp half moons of eggplant. I would have expected what you expected. I wonder if this pleasant surprise is due to the fact that fresh eggplant is relatively abundant right now (so if you went in the winter, maybe your low expectations would have been realized). Interesting theory. If that's the case, all the more reason to get thee to Central Gyros. Post haste! I'm really sorry I didn't have my camera today. I hope this convinces at least one or two people to stop in for a gyro and a plate of fried eggplant with skorthalia. 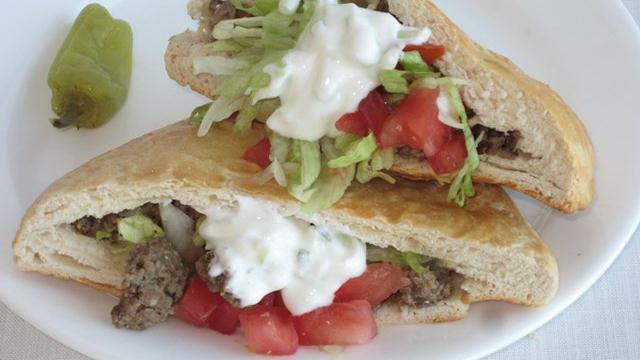 Great sandwich, perfectly crisp meat, oil-griddled pita, and tangy tzatziki tasting perfectly of cucumber. It's still on our regualr rotation. Both the gyros and the Athenian chicken are favorites. They are getting the "Check Please" treatment this Friday night. njtb wrote: They are getting the "Check Please" treatment this Friday night. Judging by our last few visits, they could use a little bit of the "Check Please Effect". I hope it goes well for them. Yesterday they had a new menu item: gyros quesadilla. We did not try. Seems they have more Mexican customers now. Interesting. I don't know of any cheese that would go well except feta. Maybe kasseri? Definitely would have to use pita as opposed to tortilla though. Waitress said gyros quesadilla uses a tortilla, not pita. metro man wrote: Interesting. I don't know of any cheese that would go well except feta. Maybe kasseri? Definitely would have to use pita as opposed to tortilla though. Chihuahua or mozz would work just fine for me. ekreider wrote: Yesterday they had a new menu item: gyros quesadilla. We did not try. Seems they have more Mexican customers now. Heh, interesting way to appeal to Hispanic customers. Always loved Central Gyros, but I never get there seemingly, except when I'm visiting friends of mine on the NW side. It's probably the most solid and consistently good place to eat in that area, period. Nice to see they got (belatedly) treatment on Check Please, since I'd somehow missed that(and never catch that show anywhere near as often as I'd like). We went here Saturday for a long-awaited gyros, and though it could have used a little more meat, it was delicious. I even tried eating it like you're "supposed to" for the first time ever; I found it less satisfying, but hey, live and learn. We can't wait to return to try something else; we had no idea that it was a full-service restaurant, not a fast-food joint. Pie Lady wrote: eating it like you're "supposed to"
Is this the wrong way (stuffed pocket, not wrap)? I say it is. Last edited by SCUBAchef on March 11th, 2013, 1:25 pm, edited 1 time in total. I never saw that before. I meant eating it wrapped burrito style. I assumed that's how most people did it. I eat everything separately—onions, tomatoes, meat, pita last. Occasionally I swap the order of the onions and tomatoes, depending on how crazy I feel. Lettuce in a gyros? No, no, no!!!! Wow! That is one of the least appetizing sandwiches I've ever seen. It's just sad, regardless of its rogue configuration. This isn't from Central Gyros, is it? I can't imagine a place with the pedigree of CG is serving a gyros sandwich that looks anything like that, despite offing the gyro quesadilla. stevez wrote: This isn't from Central Gyros, is it? NO! I updated the posted photo to reflect this.